Attended with representatives from Coffee & Cravings, Dear Babette, Chocolat Et Basil, and SG Food On Foot. Budget about SGD $45 ++ per person. 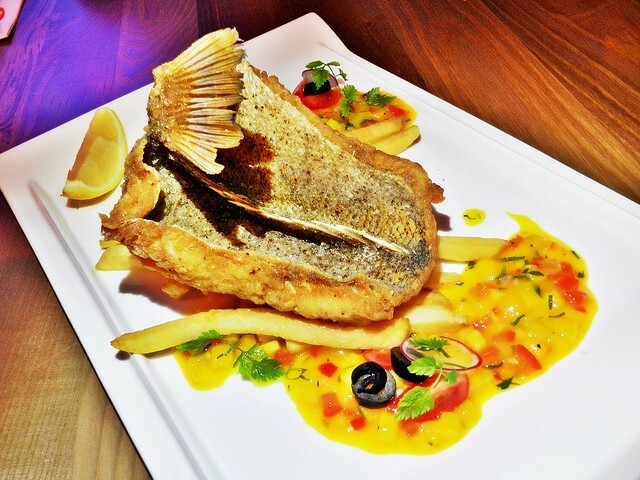 Founded in November 2014 and helmed by Chef Vincent Teng, Sunrise Bistro & Bar within the nostalgic Playground @ Big Splash, in East Coast Park, offers hearty, casual bistro fare. Sunrise Bistro & Bar may be unassuming in looks, but take a chance on Chef Vincent's creative fusion dishes, combining casual French with contemporary Asian, and you'll be hooked! 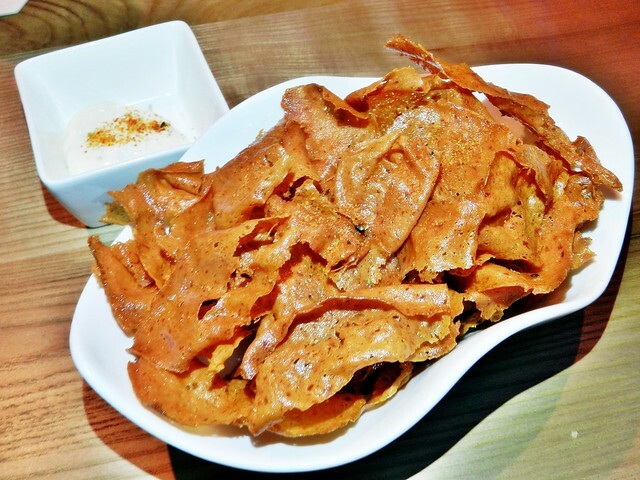 Ambience at Sunrise Bistro & Bar is clean, modern, and contemporary minimalist. What stands out for me is the spaciousness; both for the outdoor al-fresco, and the indoor dining area with live band stand. The dark mahagony colours and low ambient lighting set an intimate mood, perfect for long, slow meals with friends or loved ones. Match days for soccer are screened here too! However, I find the decor rather dull, especially the rather gaudy fish tank smack at the entrance. Service at Sunrise Bistro & Bar is pretty good for a hosted tasting session. Staff were proactive in clearing after each dish, and at least some of them are able to describe drinks / dishes from memory alone. Chef Vincent Teng came out personally to introduce the nuances of each dish, which I really appreciate. As our visit happened on a rather quiet day, I noted that staff were able to accord more personalised attention to guests, but I've yet to see them perform during peak periods. 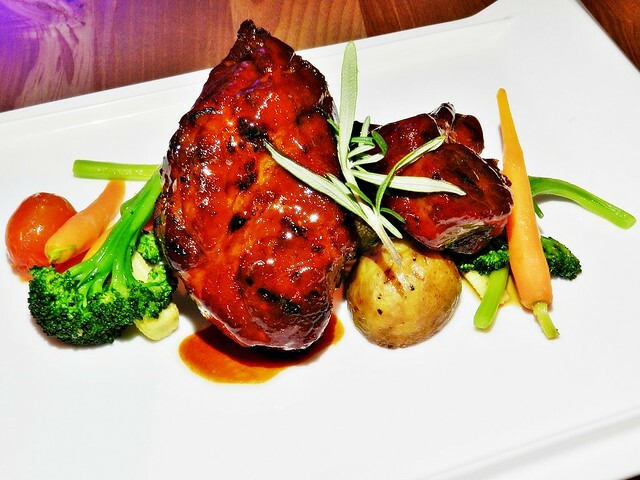 Food at Sunrise Bistro & Bar is delicious, thoughtfully crafted, and well plated. 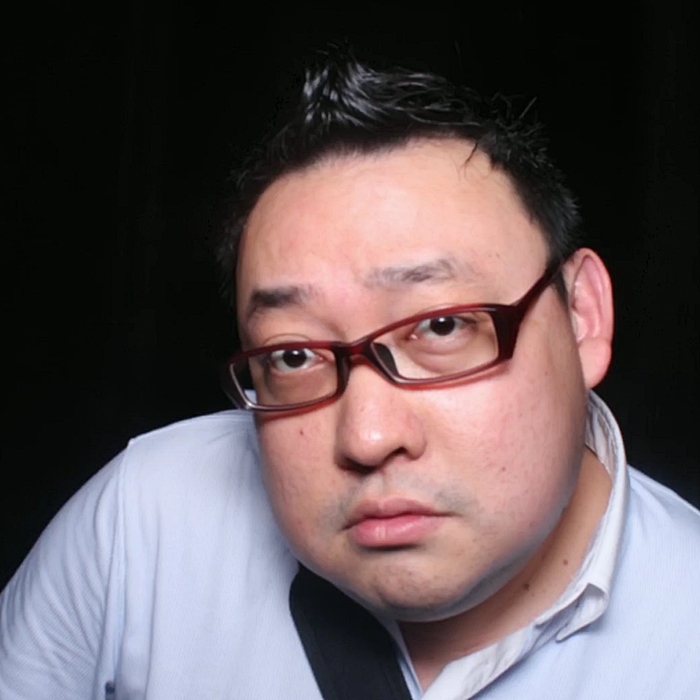 Chef Vincent has a fondness for the sous vide method of food preparation, and his unique culinary style of casual European (British, French, Italian) fused with contemporary Asian (Singaporean, Chinese, Japanese) influences mean that each fusion dish is memorable in taste. 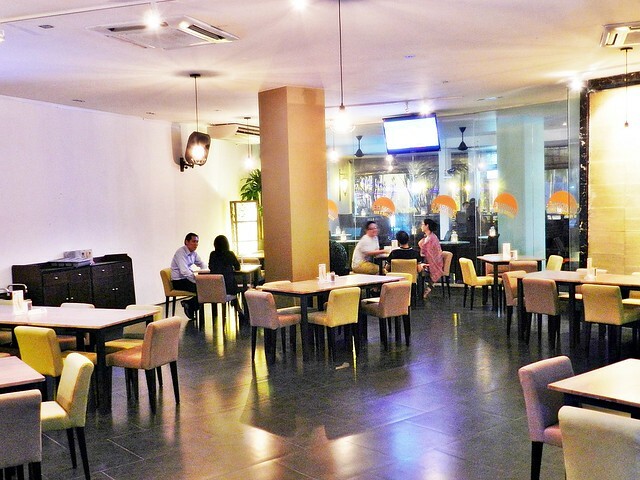 Prices are typical of a mid-range bistro, budget about SGD $45 per person for a meal here. As we were served tasting portions, the actual portion size will differ from the photos here. 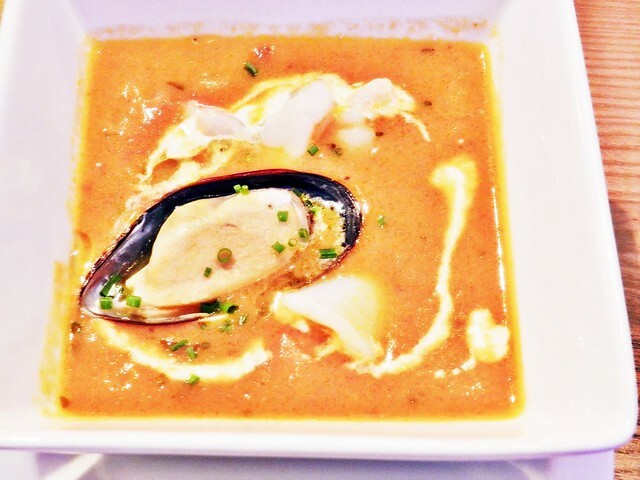 The creamy Seafood Chowder Soup (SGD $12) is pleasing to the palate, and I'm glad for the meaty chunks of fresh seafood (prawns and mussel). The rich flavour is enhanced with Chef Vincent's twist; the addition of tomato lends a distinct, sweet floral taste to this soup / broth. Pure, straight-forward comfort food, done right. 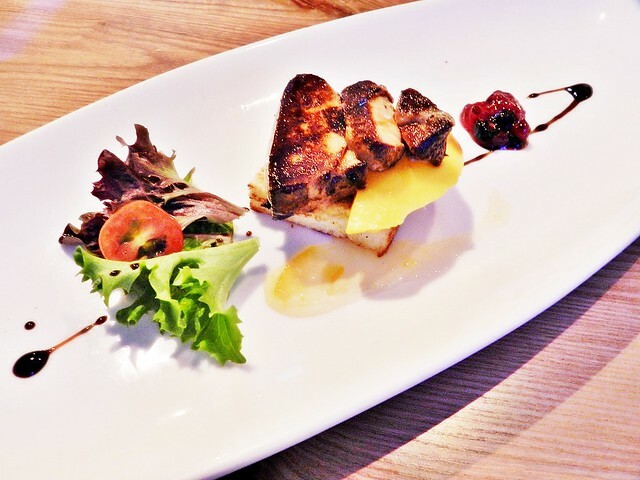 The Seared Foie Gras (SGD $19) features actual goose liver, seared nicely, served on brioche bread layered with sweet mango slices, and citrus jam and berry compote on the side. 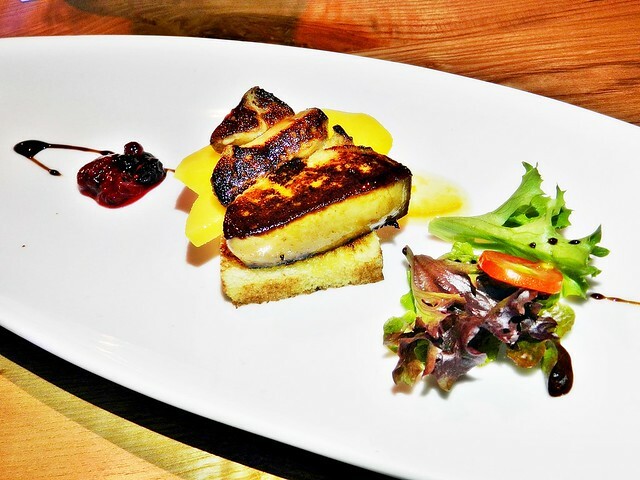 Love the buttery texture of the foie gras, and the complement of sweet mango, and tart sharpness of the berry compote, helps cut through the rich fattiness of the foie gras. Ordered the Black Swan Cocktail (SGD $20) because it's made with sous vide red wine infusion! 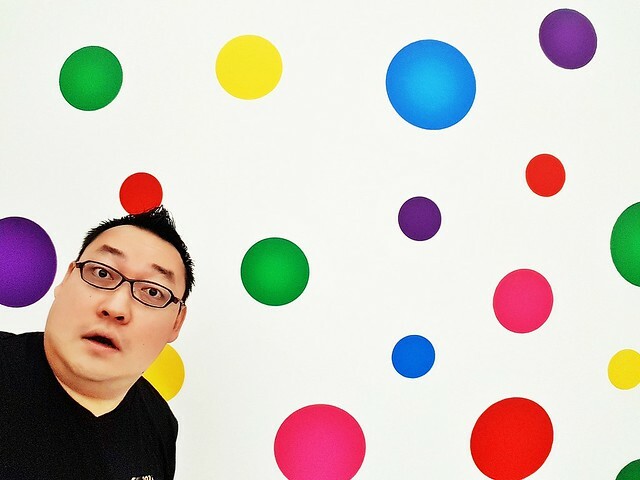 Yes, I was mind blown too. So red wine is sous vide with herbs, then mixed with raspberry liquer, apple juice, orange juice, lime juice, sprite, and green and red apple cubes. 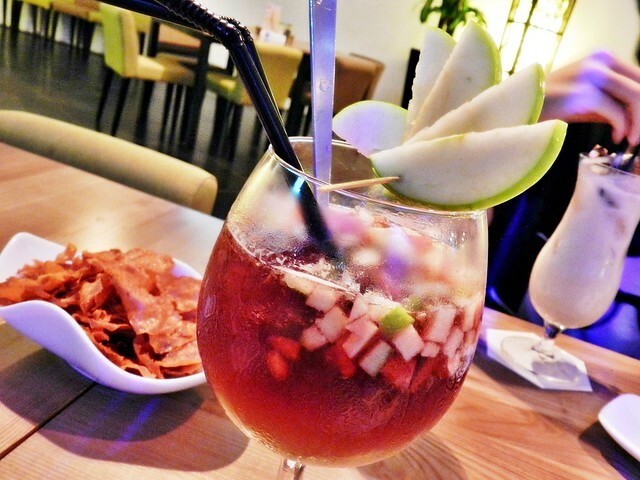 While the presentation looks like a normal Sangria, it tastes nothing like a Sangria, being more sweet, fruity, and less bitter. Will appeal to ladies as well. 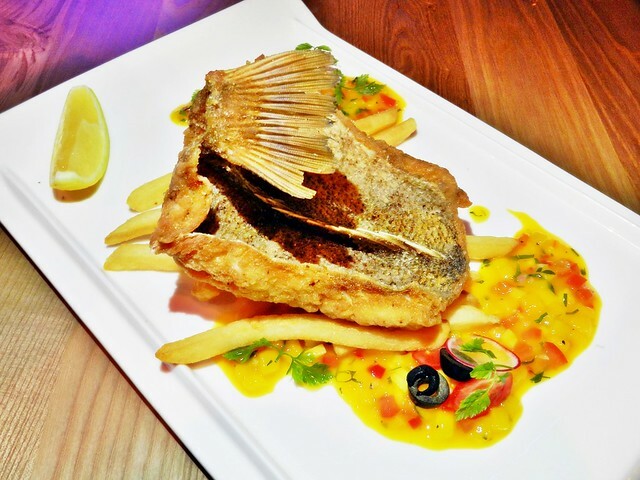 The Sunrise Fish & Chips (SGD $26) is Chef Vincent's twist on the classic, with a whole red snapper, coated in a thin, crisp batter spiced with lemon myrtle pepper, rather similar in taste to the Chinese / Malay fried fish! The fresh, white fish meat is moist and flakes off nicely, the skin is satisfiyingly crisp, though the skin is a tad rubbery in texture. Served with fries (which are average), tartare sauce, and a tasty home made mango salsa, which lends a bright, fruity sweet burst of flavour. 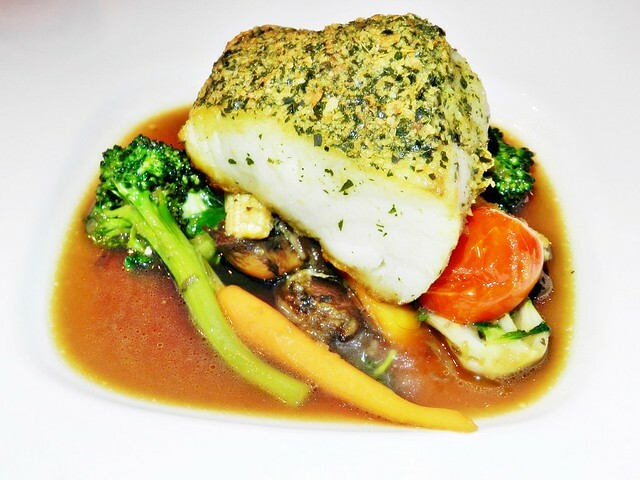 Loved the Cereal Crusted Cod Fish (SGD $28), which I had more of it! 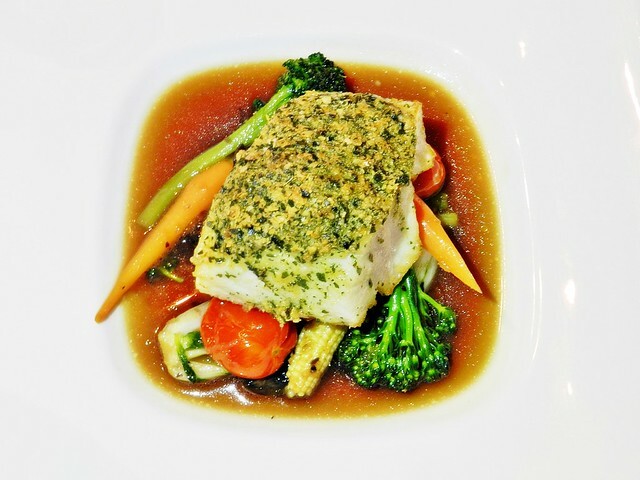 A large, buttery fillet of cod fish, coated in a cereal crust rather similar to the Chinese cereal prawns, baked and served on a bed of fresh seasonal vegetables, braised in a fragrant sesame oil and ginger shoyu broth. 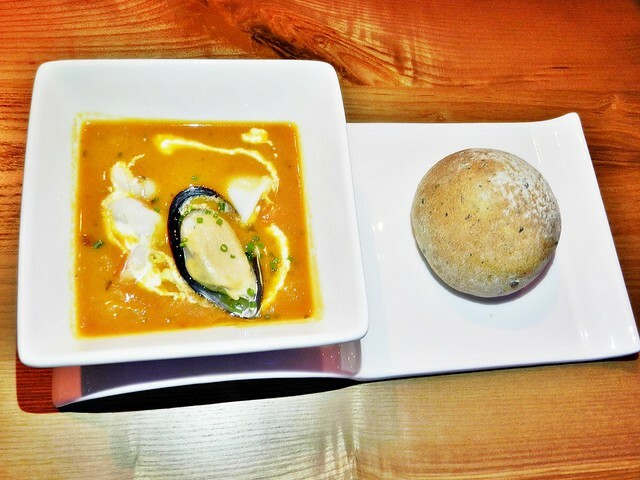 The beautiful, delicate flavours of this dish tease and tantalise, leaving a longing on the palate. Highly recommended! 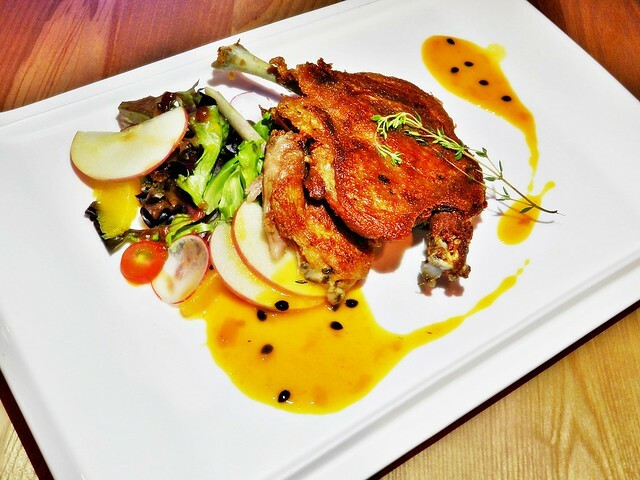 The righteous Asian Five Spice Duck Leg Confit (SGD $28) features an 8 hour sous vide duck leg, with crisp skin, yet tender meat that comes off the bone easily. 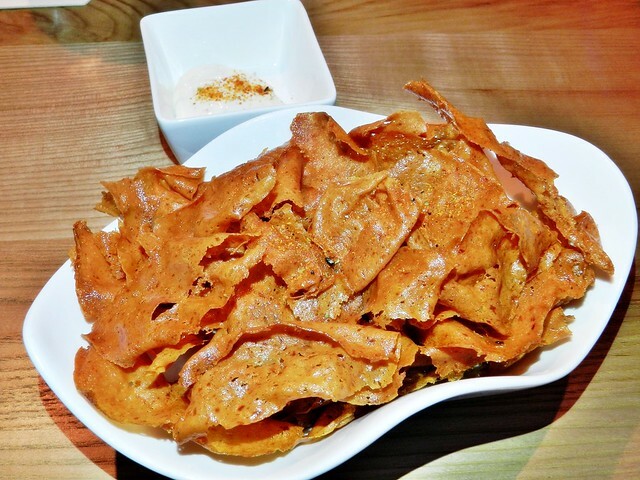 Infused with Asian five spice / 5-spice, the meat is flavourful and rich, without any gamey taste. Served with a citrus salad (which I felt was average), and a bright passionfruit sauce. 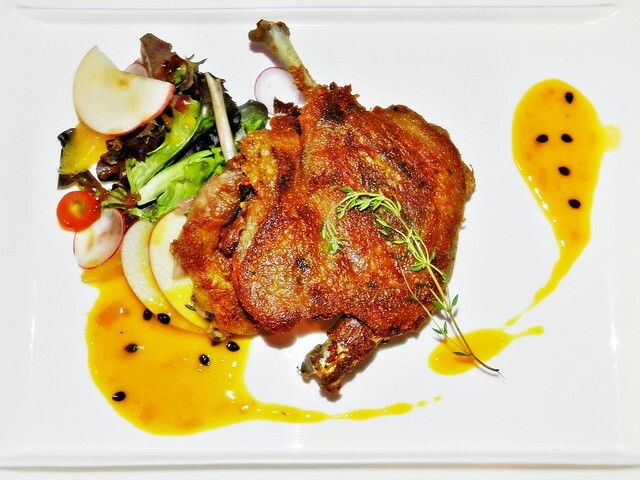 The citrus and fruity flavours help cut through some of the robust, meaty flavours from the duck. 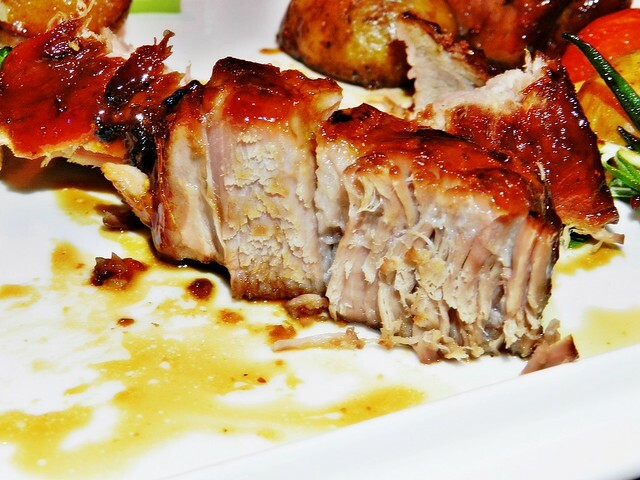 The succulent, tender pork meat of the Marmite Canadian Pork Shoulder (SGD $26) is a pleasant result of marinating the meat with marmite, sous vide, then grilling to perfection, with some light torching towards the end. Chef Vincent tries to ensure that he selects his pork shoulder carefully, the best cut is those with fat within the meat itself, which helps the pork shoulder to retain moisture during cooking, and lends that luxurious, velvety texture. Served with seasonal vegetables, I loved the savoury, robust flavour of the pork, with a slight hint of sweetness and smokiness. Excellent! 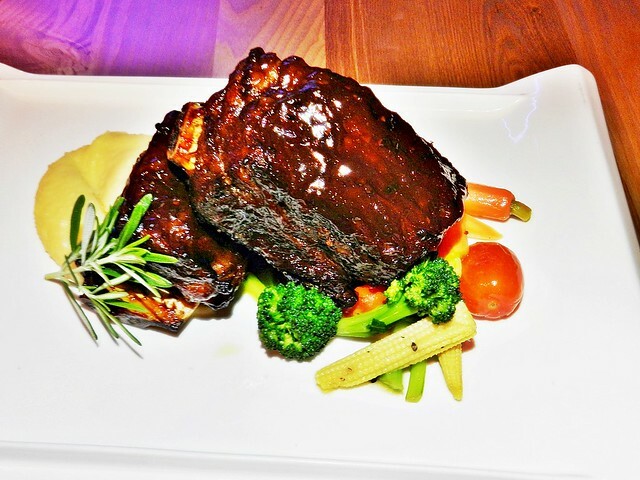 The BBQ Beef Short Ribs (SGD $32) have beef short ribs that are sous vide for 24 hours, which makes the meat very tender. 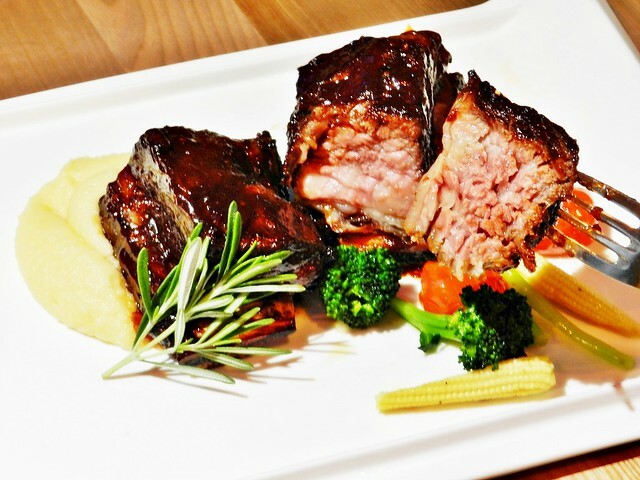 Roasted with home made barbecue sauce, which is more savoury than sweet, similar to the Malay Indonesian bakar that has kecap manis, and served with seasonal vegetables. While it's not the most tender beef I've had, the beef meat still comes easily off the bone, though it requries slight effort. The cut we sampled also had a lot more fat on the meat, though this is easily removed. Still a beautifully done piece of meat, worth ordering! 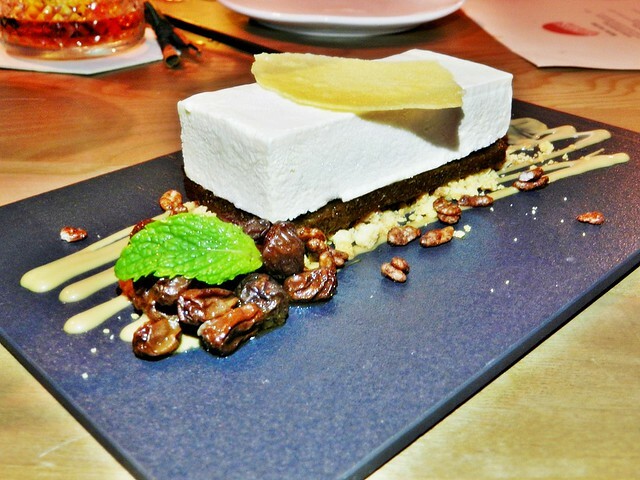 The Tiramisu Semi Freddo (SGD $12) is sort of a deconstructed tiramisu. 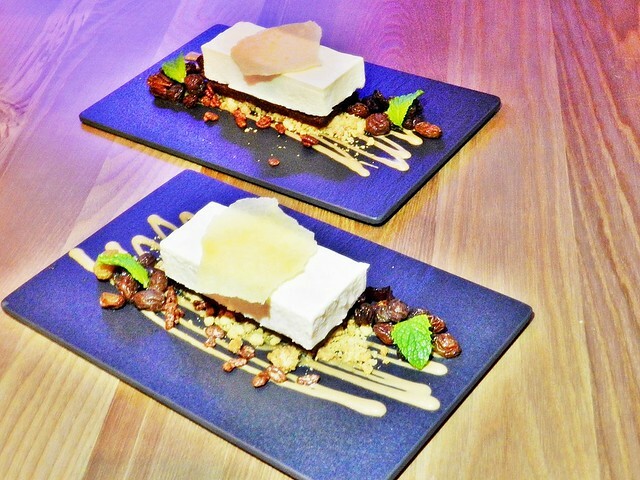 Semi frozen, pudding-like mascarpone cheese is layered with coffee liqueur jelly sponge, garnished with crunchy milo bits and tuile biscuit. Eaten separately, each component makes no sense, but when a bit of everything is eaten together in 1 mouthful, then you'll get the taste of the tiramisu. Rather unique take on this classic Italian dessert. 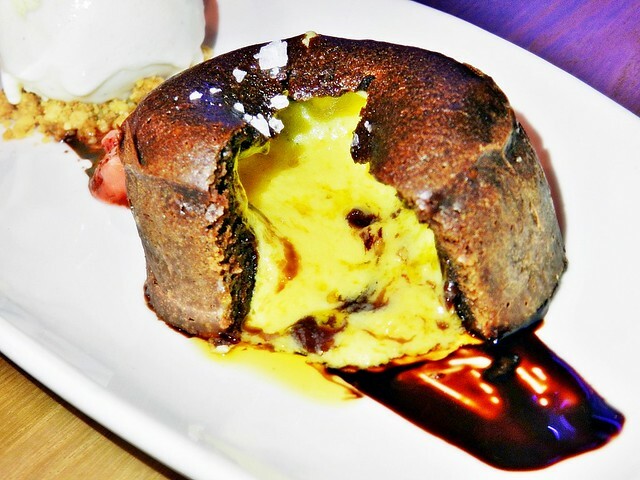 The Salted Egg Yolk Custard Molten Chocolate Cake (SGD $14) has several great things going for it. 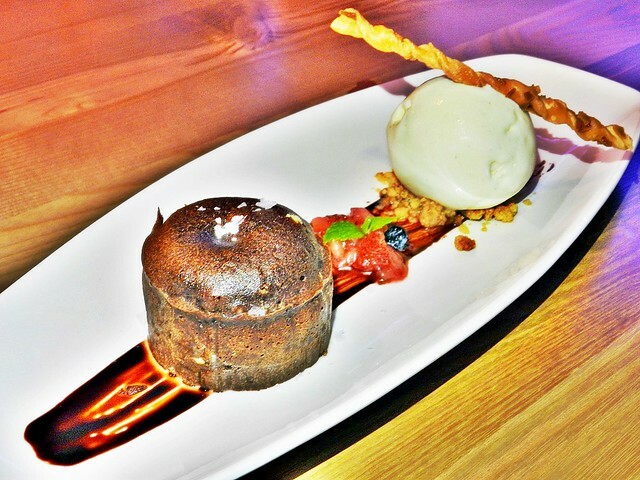 The warm chocolate cakes is rich, dense, moist, and intense in chocolate flavour, like a really good brownie. Cut it open, and gooey, thick salted egg yolk custard oozes out sexily, hot and intense in taste. However, I personally find that when eaten together, the flavours tend to cancel, rather than complement, each other. Resorted to eating the components on their own, and still really enjoyed this dessert! 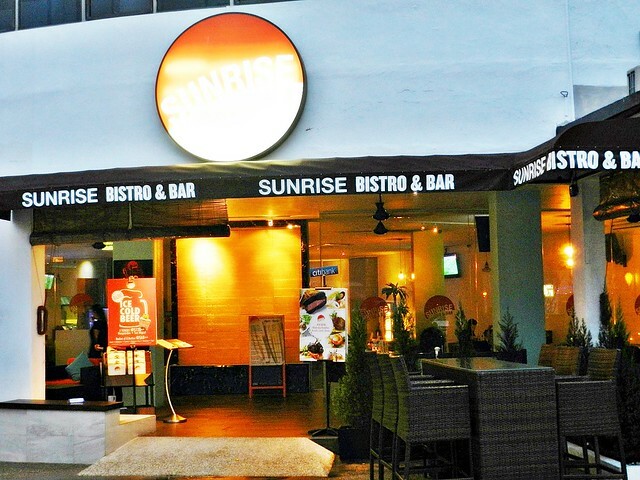 Overall, Sunrise Bistro & Bar is a great place to relax and have a good meal. With Chef Vincent Teng at the helm, you're assured of quality bistro food, a modern fusion of European and Asian influences, each dish packed with flavour. Worth the price, and the journey here.